CPG customer uses Netvibes Dashboards to monitor regulatory changes and proposed legislation that can impact its business in a highly regulated industry. Q: What is the most efficient way to track regulatory changes related to my business across many different geographies? I: Netvibes market intelligence enables Tobacco Inc. to position its business strategy ahead of any new regulations. For example, when news broke that a country was planning to make it harder for Tobacco Inc. to sell its products, the company quickly mobilized lawyers to lobby against the new regulations. O: Using customised social data, Netvibes sends out immediate email updates to Tobacco Inc. about any relevant news, all in real-time, 24/7. The company can now easily keep their team updated, anticipate any regulatory changes, and react to previously unknown business opportunities and challenges. A global consumer packaged goods (CPG) company in a highly regulated industry (tobacco and alcohol) uses Netvibes Dashboards to stay updated on all regulatory changes and proposed legislation that could impact its business. The company can efficiently monitor the entire industry with ease and ensure its products and processes comply with all legal regulations around the world. Netvibes delivers the real-time market intelligence Tobacco Inc. needs to quickly react to market changes and maintain competitive advantage. “Tobacco Inc.” [company’s real name changed] is a large, global manufacturer of consumer goods, including tobacco and alcohol products. With many subsidiary brands across different verticals, Tobacco Inc. needs to collect a wide variety of data related to customers, global markets, industry research, news and social media. Because the company operates within several highly regulated industries, Tobacco Inc. faces the formidable challenge of staying informed about new laws and regulations that may impact its business across different countries and states. Anticipating proposed regulatory changes is critical for the company in order to proactively influence lawmakers and achieve compliance in an ever-changing environment. Due to inefficient monitoring processes, the company was often overlooking critical pieces of proposed legislation. The rudimentary filtering and limited search capabilities of existing tools overwhelmed Tobacco Inc.’s researchers with a flood of insignificant or unrelated content, forcing employees to spend valuable time sifting through massive amounts of data looking for needles in the haystack. In addition, the team’s lack of collaborative tools meant that sharing any key findings with the extended organization was a manual process prone to errors and often resulting in lost information. The Netvibes Dashboard provides an all-in-one view so that Tobacco Inc. researchers can see what is being said in the industry. 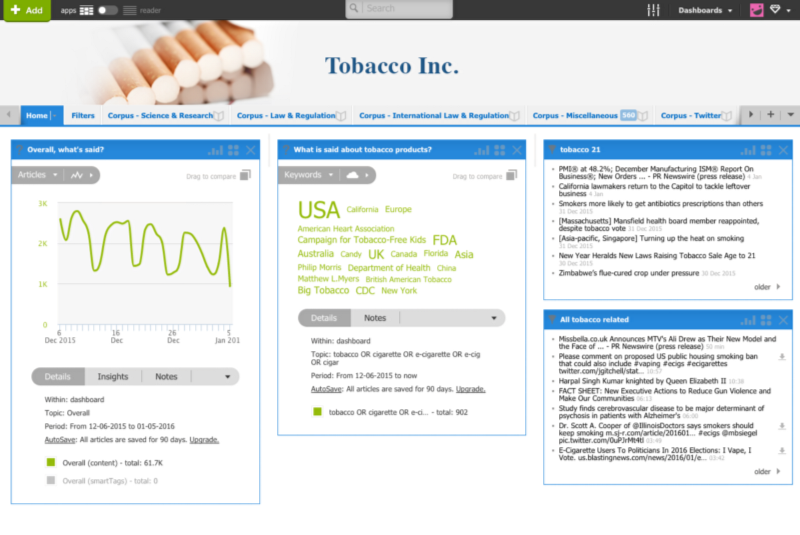 Today Tobacco Inc. uses custom Netvibes Dashboards to aggregate a wide variety of data from online and across the organization, performing automatic analysis in order to discover actionable insights that keep Tobacco Inc. apprised of regulatory changes and ahead of competitors in the industry. With advanced filters set up to analyze only the information and social conversations relevant to a specific focus area, Tobacco Inc.’s analysts are now able to save time on monitoring while detecting key trends they previously would have missed. Opinions, available only with Netvibes Dashboards, allow Tobacco Inc. to share content and insights across the organization more quickly and efficiently. Today, when key pieces of information are discovered, Tobacco Inc.’s researchers can instantly classify the content based on geography, type of regulation, and products impacted (or any other variables). The Netvibes dashboard also automatically recognizes and tags content with labels that Tobacco Inc. can pre-set. Once categorized, relevant information is instantly routed to the appropriate team(s). For example, all articles with the Opinion “USA tobacco regulations” are forwarded to the regulatory team in that geo. In order to share Opinions and insights, Tobacco Inc. has designed custom email “Regulatory Digests” that keep its employees informed about critical information impacting the industry. Many of these Pushmail Digests are automatically distributed on a regular daily/weekly/monthly schedule to specific teams, while highly critical or time-sensitive insights can be pushed out instantly in response to certain keywords or triggers. Real-time market intelligence enables Tobacco Inc. to position its business strategy ahead of new regulations. For example, when news broke that a country was planning to make it harder for Tobacco Inc. to sell its products, the company quickly mobilized lawyers to successfully lobby against the new regulations. With Netvibes MisoData, Tobacco Inc. not only monitors information from across the internet, but also its own internal company metrics, enabling researchers to compare and analyze everything together and understand how market trends impact business. For example, when Tobacco Inc. added a new warning label to its products in order to comply with new regulations, the company was able to analyze customer reactions to the new label and measure the impact on sales and profitability. Netvibes analytics also provide Tobacco Inc. with baselines of performance, enabling the company to measure ROI and compare results over time. Using Netvibes Dashboards, Tobacco Inc. is now able to efficiently monitor market trends, research and react to proposed legislative changes, and ensure that all company products and processes meet local regulations wherever they are sold.